To be honest I expected more from the second show in New Jersey, as historically the second show in the same city has been much better than the first. Case in point, Chicago2 was worlds better than Chicago1. But it is a U2 show, so of course it was great, but I was really hoping for “A Sort of Homecoming” and something different in the encore. I woke up around 8am after about 4 hours sleep after Jersey1. I literally stayed in bed in my hotel room all day streaming shows and blogging. Around 3pm I found out the band had already arrived and were inside sound checking, so there was no point in me going over to the stadium early. Around 4:30 I called for a Lyft and was at the stadium by 4:40. I noticed there was no line to get in, so I figured they let the GA line in early. I went through security got my wristband, turned the corner and saw the GA line on the ramp, so I was stuck and had no choice but to wait in line to go in. Just as few minutes after 5pm I was inside and found a spot on the back RedZone rail just about 5 people from the tree stage. Ironic the latest I left the hotel was also the earliest I went into the show. I ran into Melissa’s parents, and then a different Melissa, Deb and her husband and Jenny across the tree stage. I stood with Michelle for the first part of the show. The Lumineers took the stage for the last time at 7:33 and played until 8:25. When everyone cheered when they said it was their last show, I was clapping for an entirely different reason. Larry started his strut along the catwalk at 9:27 and U2 played for two hours. Bono missed coming into the second part of “New Year’s Day” and asked them to play it again. When “Bad” started, it was the only time I can remember ever being disappointed because it is one of my favorite songs, but I have heard it any times and have only heard “A Sort of Homecoming” once (in Chicago2) and thought for sure they would play it in Jersey2, but sadly they did not. After “Streets,” Bono exclaims, “Thursday already better than Wednesday!” He was referring to Jersey2 was already better (after 5 songs) than Jersey1. I am not so sure I agree with him. Bono gave a shout out to Michael Stipe during “Still Haven’t Found.” Of course he was at the soundboard the night after I stood there. 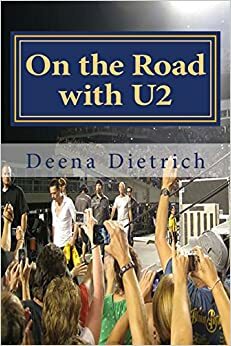 After “Vertigo,” the big change in the set list was “Mysterious Ways” AND “Ultra Violet.” Bono again danced with Khelia during “Mysterious Ways” – first time this tour though. The show ended with “One.” I again took the Hilton shuttle back, but this time I was on the first shuttle off the lot. I walked back to my hotel next door to the Hilton and was in my room before midnight. I was awake until after 2am posting photos and videos. Please click here to see my photos from Jersey2.